I'm going to try to get the old cliches out of the way immediately, so that we can focus on the important things after. If you really like the Cartoon Network show Ben 10, you can probably promptly disregard this review and find your way to the nearest Wal-Mart to pick this up. For fans, this is likely as decent an effort as one can expect these types of license cash-in's to be, and the more rudimentary aspects of the game design will be ignored. I tend not to review games in a vaccuum, however. So for me, and others like me, there's quite a bit of bone picking to be done here. Unlike many television shows that get picked to be turned into videogames (That's So Raven, for example), Ben 10 actually makes a lot of sense. 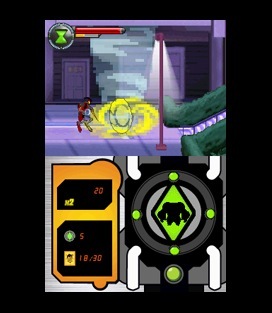 Truthfully, watching Ben 10 is sorta like watching a generic videogame concept: he can transform into different aliens, each which have specific powers that help him get past obstacles and defeat enemies, and the Omnitrix (the watch that gives him his powers) even has built-in limitations needed to give most games reasonable balance. Every so often, your watch will power down and you'll be left mostly vulnerable as you wait for it to recharge. It's almost perfectly pre-molded for videogames, so it's no surprise how the game works. The story, which is probably a big draw for some people, seems to me like it worked in a good excuse to have Ben lose most of his abilities early in the game so that he can be forced to retrieve them again over the course of your playtime. Now I honestly tried to pay attention, but without much interest in the show I felt like I was missing something. But apparently some DNA is removed from your watch, which is why you lose most of your transformations. Over the course of the game you'll visit Area 51, space, The Hoover Dam and more in an attempt to get back what is rightfully yours. You'll be using your watch to turn into these aliens like Heatblast or Fourarms, each having special abilities which can overcome all sorts of trouble. Fourarms can scales vines, while Heatblast can absord fire in your path as well as glide great distances. The execution is where it gets shady. Each level works pretty much the same: you'll be journeying and every so often you'll run into a little obstruction which only one of your forms can pass. It's always supremely obvious what to do, and it never feels much beyond a waste of time. What's worse is that the level design is always dull and uninspired, giving little incentive to move on unless you're a big fan of the show. Most of the controls themselves feel fine (jumping, etc) as does the touchscreen transforming... but there's just not much worth doing to make it matter. Continuing forward, you'll then run into any number of enemies which you'll need to defeat before moving on in classic beat-em-up fashion. It's not exactly rocket science, and although you can upgrade abilities for each of your forms it's pretty much non essential since you can easily conquer every level without even touching the vast majority of the upgrades. The real sin is the hit detection - the game never throws the proper weight behind your punches, and your enemies never quite seem to react precisely when you hit them (or if they do, they often spazz out in weird fall down animations). It's just sloppy, and it removes much of the visceral feedback to really elevate it to that next level. When Streets of Rage still does it better, there's a problem in my opinion. In the game's defense, the bosses at least are pretty rad and definitely make up the most engaging aspect of the title. I'm not saying it's all bad, I'm saying so many games do this sorta thing so much better that it's not really worth the time or investment unless you keep posters of Gwen Tennyson on your wall. I should hardly be surprised by the outcome considering what these types of videogames usually end up being, but you always hope maybe you'll be playing a hidden gem. Not so this time, unfortunately.